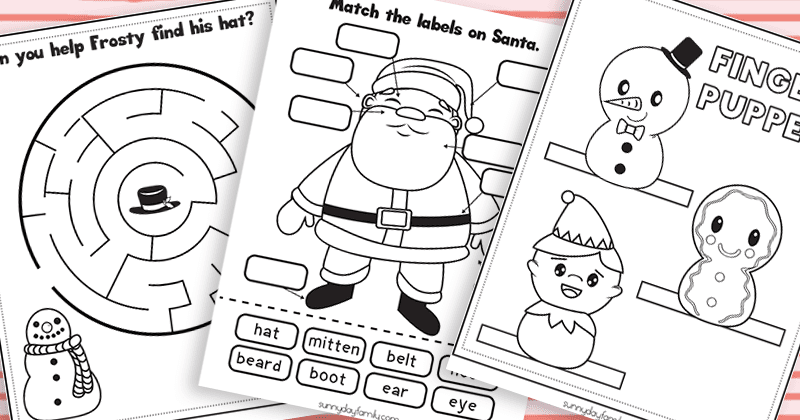 Free printable Christmas activity pages for kids to enjoy. Looking for a way to keep the kids entertained this Christmas season? You're in the right place. I've got 12 free printable Christmas activity pages for kids that your little ones will love! My 5 year old twins love these Christmas activity pages. They are perfect for those times when we need a little quiet time - waiting in a restaurant, at the doctor's office, or just when I could use 5 minutes of peace to get dinner on the table. Finger puppets to color: a snowman, gingerbread man, and elf. Just color, cut them out, and tape the tabs closed for a super fun holiday puppet show! Christmas shapes tracing page: a star, stocking, candy cane, and Christmas tree. Santa label and color page: this is so much fun! Color Santa then cut out the labels underneath and match them to the correct parts. Christmas I Spy: color and find all the Christmas items. Christmas match game: color and match the two sides of each holiday item. Decorate the ornament: draw and decorate your own ornament - you can even hang it on the tree! Christmas word search: perfect for new readers. Snowman maze: help Frosty find his magic hat! Build an elf: Color the elf, then cut out the pieces and assemble him for a fun Christmas decoration. Glue a craft stick on the back to turn him into a puppet! Click the button below to download these activity pages for FREE. 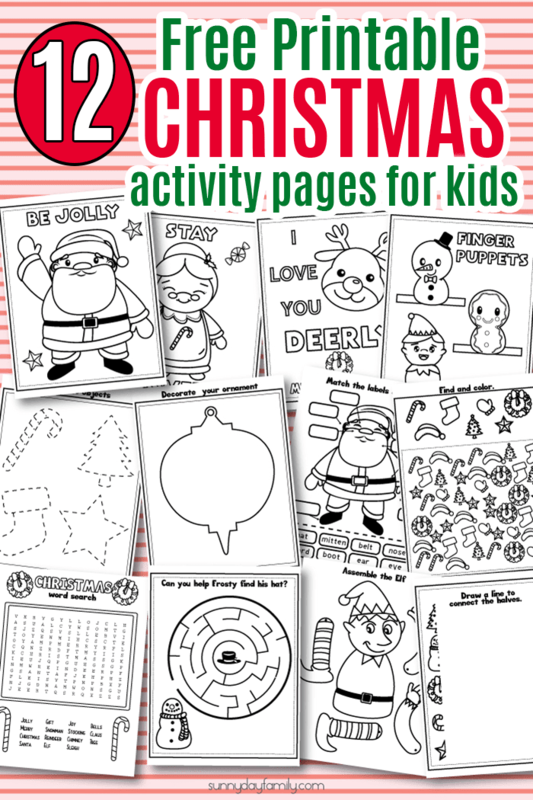 Once you've downloaded your activity pages simply print them out and enjoy the Christmas fun. They all print in ink-friendly black and white as they all double as coloring pages too. Your kids will love them!